Pacing is hard. I try to diversify my pace as much as possible but actually executing my planned pace for the duration of a run is hard…for me. Some days I’m supposed to be running hard and my legs feel like concrete and I end up running slower than I wanted. More often however, I’m scheduled to run an easy day and I’m feeling good so I ignore the plan and run way too fast. When I’m back home I feel great…until I look at my watch and realize I failed to pace well and I know in the pit of my stomach that I’ll regret it later. Executing the plan can be hard but what if you don’t even know where to start? Well, here is how I calculate my “easy,” “moderate” and “hard” paces. 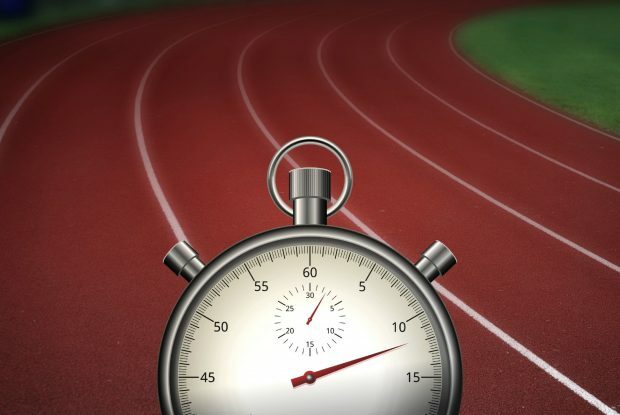 Warm up and then run a mile on the track as fast as you possibly can; add 2-3 minutes to that number and you’ve got your “easy” pace range. If you’ve got a watch that tracks your heart rate, that “easy” pace should be roughly 65-75% of your max heart rate. Take your easy pace and subtract 60-90 seconds; this number should be roughly 80-90% of your max heart rate. Take your easy pace and subtract 2-2.5 minutes; this number should be roughly 95-97% of your max heart rate. Now that you’ve got the numbers to diversify your pace, learn from my mistakes and use them wisely! Stick to the plan!